Earlier this month, Alexandria Ocasio-Cortez went on national television and said that the United States should tax incomes above $10 million at a 70 percent rate. There was never much evidence for this assessment. In public opinion polls, raising taxes on the rich consistently ranks as one of the most popular ideas in American politics. Moreover, political-science research suggests that the American people’s resentment of the wealthy is bitter and deep — and, in the not-too-distant past, Democrats succeeded in leveraging such resentment for political gain. Meanwhile, as far as plans for class war go, Ocasio-Cortez’s was more “Jimmy Carter” than “Jacobin.” As recently as 1980, the U.S. taxed all incomes above $216,000 (or $658,213 in today’s dollars) at 70 percent rate. And recent research on optimal taxation has suggested that the ideal top marginal rate might be closer to 80 percent. These facts led certain bloggers to describe the congresswoman’s idea as a “moderate policy.” And now, a new poll has confirmed that such bloggers are, in fact, profoundly wise. Over the weekend, pollsters from the Hill–HarrisX asked voters, “Would you favor or oppose a tax proposal that would apply a 70% rate to the 10 millionth dollar and beyond for individuals making $10 million a year or more in reportable income?” — and 59 percent said yes. 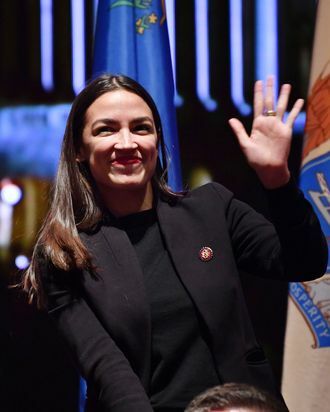 The idea was “popular in all regions of the country.” Southerners backed it by a 57-to-43 percent margin, while 56 percent of voters in rural zip codes agreed that the socialist congresswoman was onto something. Even 45 percent of self-identified Republicans approved. There are reasonable critiques of Ocasio-Cortez’s tax plan (raising taxes on capital gains might be a more effective way of soaking the superrich; a confiscatory top marginal rate might prove impotent, absent a global war on tax havens; socializing the means of production, under the control of a workers’ state, might be a more technocratically efficacious means of reducing America’s Gini coefficient). But the notion that it’s “politically damaging for Ds” ain’t one.